Exit intent technology has been around for awhile and mostly used by e-commerce stores. Exit intent is basically a pop-up or an overlay that tries to retain the user before he or she leaves the website. The user did not find what he was looking for. The user got confused after coming on the website. The prices on the e-commerce store are not affordable. The design of the website is not user-friendly and conversion-friendly. The content on the website is irrelevant or not engaging. The user could be looking for discounts and offers. The user was just browsing and was not interested in purchasing anything. The exit intent overlays give you a second chance to get your clients interested in visiting some more pages on the website or the e-commerce store. If the exit intent comes with any discount or offer, then it may increase the conversion rate as it may allow them to get back to their abandoned cart and proceed further in the checkout process. The exit intent pop-ups may also lead to increased number of registrations on the website. You may give freebies or any free e-book and ask them to leave their email. This would help in increasing the subscriber’s list for email marketing. If the messaging used in the exit-intent overlay is different and more impactful than the content on the website, then the visitor may pay attention to the website again. It would also tell you that the communication style on the website needs to be improved which could help in increasing the conversion rate of the website. Summing it up, the exit intent technology works towards bringing the users back to the website. It helps in realizing what exactly the users are looking for and how to provide them that. Now, let us understand with examples how can you make the best use of exit intent technology for your website. Discounts are a great way to engage your users especially when they are leaving the website. You can define pop-ups for various actions taken by users on different pages. Let’s say you just want to give a discount coupon to only those who are just on your product page and not the blog or any other information page. As you can see in the given pop-up image, the website has given two options to the leaving visitors. First, get $50 off on the first order and second, log in using Facebook or Google+. This is basically nothing but attracting the user with a discount and also giving him an easy way to sign up on the e-commerce store. Should the user decide to sign up, he could be reached via email marketing later on. Exit intent technology can be used for increasing the email subscriptions on your blogs as well as your e-commerce stores. 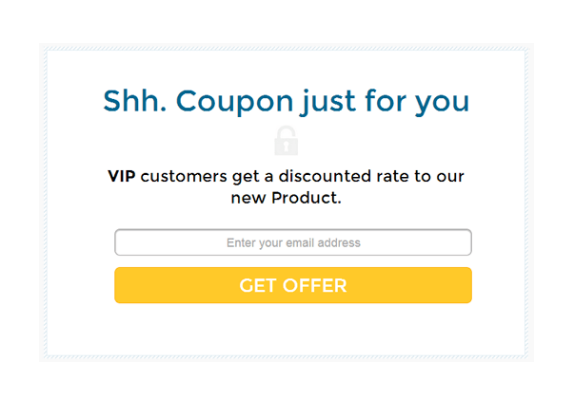 Example: As you can see in the image below, it’s an exit intent discount coupon for an e-commerce store where the message is clear and personalised. Now, you must be wondering, how do I increase subscriptions on my blog/website? Here is an example for you. 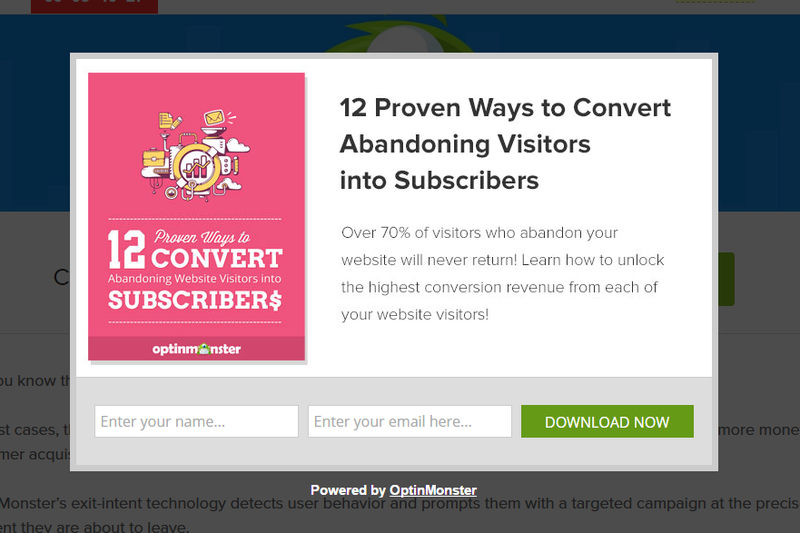 This is the screenshot from the exit intent pop-up of the Neil Patel’s blog. As you can see here, the copy of the pop-up is very clear and to the point. It just promises to deliver value to the inbox of the user. If you use a copy of this sort and promise to deliver value to your users, the conversion rate on your sign-up forms would increase. Another way to get email sign-ups is to offer a carrot or lead magnet to the user. Just like how OptinMonster does. It offers an e-book on 12 proven ways to convert abandoning visitors into subscribers and asks for your details for delivering it to you. Similarly, if you are providing services or have any innovative product, then, you may use an e-book as a lead magnet for attracting the users. Yes, if you are conducting a webinar, exit intent pop-ups can help you increase the registrations on your webinar. 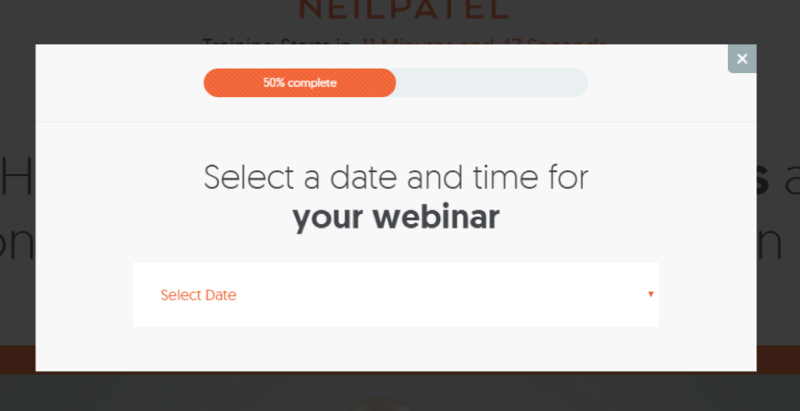 You can simply ask your users to reserve their seat if they don’t want to miss your latest webinar. Make it short and personalised. 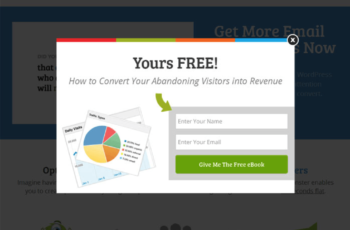 Attach a lead magnet in your exit intent pop-up. Highlight the call to action button. A/B test your pop-up design to check which one performs better. Analyze the results for a week and then use the best pop-up on the website. Ask for minimum details.The more details you ask for, the less the chances of conversion. Exit intent technology can prove to be very helpful for increasing the conversion rates on your website. You just need to use it the right way. Create engaging and converting pop-up overlays. There are various tools/plugins like optinmonster, sleeknote, etc. available out there in the market which allow you to create amazing user experiences. You may use one of them or write your custom code for your exit intent overlays. If you have any queries or suggestions, you can mention those in the comments and we will be happy to help.